“It’s a wonderful time to be a CMO in the B2B world,” suggested Margaret Molloy, in a recent Forbes article. The role is rapidly changing and those marketers who can lead the change are poised to have significant impact. Prior to joining Optanix as CMO, Melissa Puls, as CMO of Progress, helped generate more than 75,000 new qualified leads, resulting in $35M incremental pipeline creation and $17M new revenue for the company. I was fascinated by the degree of specificity with which she could articulate her department’s top- and bottom-line impact. Below is an excerpt from the interview with Puls regarding how she transformed marketing at Progress to create a more accountable function. Kimberly Whitler: The leads / revenue increases you helped generate at Progress are impressive. Can you elaborate on what you did, how you measured the impact, and the results you’ve achieved? 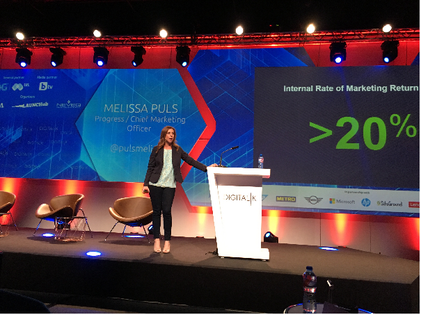 Melissa Puls: Essentially, I changed the systems and processes by which we marketed. I worked with key peers (e.g., Sales, GMs, etc.) to create a whole new process to drive accountability by function and individual. To do this, we had to put a more rigorous process in place. I’ll explain how the process works now. The very first thing that we do as a team is to break down the firm-level objectives to assign quotas by function. This is then broken down and assigned to individuals within functions. We sync these quotas up to specific sales objectives by product line and project. The objective is to align the sales objectives with marketing and to ensure that we are working together to achieve company goals. As an example, for one new product introduction, marketing had 100% of the lead/conversion goal and had a specific revenue target to hit. On another product, the focus was on relationship development so the sales team had more responsibility for generating the revenue. We essentially work together to figure out how to disaggregate the macro financial goals into specific deliverables by function, individual, and product. Once this is done, we then assign based on these goals. For example, let’s assume that a marketer has a business development target and that they have to deliver $30M of new bookings. We then determine the budget that is required to generate the leads, nurture, and convert into the revenue target. Once we identified exactly who and which function will generate specific sales and what the budgets are, we then create “waterfalls” (i.e., specific targets for generating website traffic and then converting into marketing leads and then converting through engagement process and then scoring leads to determine the level of qualification and then converting through to trial). At this point, the salesperson will look at the marketing qualified leads and will they have a certain amount of time to convert to sales qualified lead and they are working to close the lead. We have service level agreements (SLAs) that have been developed with the sales reps; these agreements detail how quickly sales will respond to the leads sent. This creates standards against which we “toss the baton” from marketing to sales to ensure that there aren’t any drops in the handoff. Then, every week, marketing meets with sales, the Chief Revenue Officer, the GMs, and the Chief of Demand Generation to through all of the performance metrics we defined. We go through each stage of the conversion process and waterfall to identify opportunities for improvement. Every percent you can improve your conversion throughout the waterfall drops directly to revenue generation. Whitler: What are the key attributes of the transformation? 1. Standardized the system: Before this, we had a number of different systems that different people used. The key to working together was to ensure that we all worked off of the same core systems. So we converted to one system for marketing automation (Eloqua), one for sales force management (salesforce.com), one dashboard system (Tableau), and then we implemented the best-in-class benchmarking (waterfall) that SiriusDecisions created. 2. Aligned the organization: We centralized the demand center and responsibility for performance in one marketing team (before it had been distributed to more). We focused on implementing best practices within demand gen based on prior research and white papers. This created a unification that had been missing..
4. Identify goals by person/function: Allocated responsible to not only the functional level but to individual level and ensured clear, single-point accountability. 5. Create a regular process for meeting, reviewing, adapting, and reporting. 6. Align the budget to the target to the individual/function. Whitler: What advice would you give to B2B Marketers who are trying to drive lead gen that connects to measureable business results? 1. Don’t be afraid to take on a quota. I’m talking about impact to revenue. You have to have a specific target and know how your function will contribute to the firm’s financial performance. 2. Put a target out there so that you can measure your team against it. 3. What is really is challenging is to convert the macro goal into individual level measures. This takes discussion and deliberation. It’s not critical that you get the target perfect in the beginning. There has to be room to miss the target and to adjust the system and learn. Over time, however, the team should get better at setting targets and hitting them. 4. Remember, although marketing may hit its target, there is no celebration until all of the units are hitting their targets. It’s a partnership. If we hit our target but pass the baton and the next group is struggling, we have to ask what we can do differently to help them achieve their targets. business results to drive success. It works best when all functions hit their goals.